Your art will shimmer in this frosted gold metal picture frame. The slightly rounded profile is canvas friendly up to 1”, and can cover canvas edge irregularities, hiding slightly out-of-square issues. Its slim, contemporary look will make your paintings, prints and photos the stars of any space in your home or the gallery wall. Customize your size up to 83”! The frame is beautiful! The gold is subtle and not too yellow. I needed 3 custom- sized frames for my paintings. These were perfect, shipped promptly and were easy to assemble! Excellent choice for the special feature my embroidery needed. The deeper rabbet of this frame allowed enough space for the sheer top layer of my embroidery to cast a shadow on the back layer, adding to the dramatic effect. Perfect!! Excellent service and products. Very pleased. Came very well packaged with great results. No damage! I have been looking for a simple, affordable gold frame for awhile and priced them at a few stores. I was not sure about putting the frame together but it was easy and kind of fun. The frame is perfect for my canvas. Could not have been easier to order and frame! The frame perfectly enhanced the artwork without drawing attention from the detailed work. Easy to put together and hang. 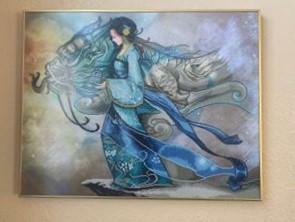 China Girl and Dragon--Diamond Dotz project from Mary Maxim. The frame itself is wonderful and was pretty easy to put together. I had some difficulty due to the fact I got a 4 foot wide one and had to reinforce the centers because of bowing in the center the picture kept falling out. Once I found a solution for that it was fine and it does look very nice. Hello Cindy. Thank you so much for being a valued customer of Pictureframes.com. Thanks so much for your kind words. We want you to be nothing short of delighted when you order with us, so we certainly appreciate your feedback. Typically, when you have a narrow 5/16" frame such as the NCFGL, you will need to add extra hanging wire in the middle as a support brace. Please reach out to us by phone or email if you intend on ordering a large frame of this size. We would like to offer you more guidance to ensure the order fulfils your expectations. We can be reached at 1-800-332-8884. Thank you! because I wanted large gold colored frames and I couldn't find them other places. It coordinates with the finishes in the room. Simple, clean & perfect for showcasing vendor adds! This frame has been the one that I have chosen for my own personal paintings. They all match and the frame is appealing and sturdy. My stretched canvas frames fit nicely within and also ones that I create on wood. Been a long time member, thanks. Have purchased before. Liked it. I am looking for more of a polished brass look. Does the frame look like spray paint gold, gold leaf, or more of a polished brass look? Thank you for your inquiry. This frame has a frosted gold finish so that is more of a muted color opposed to your shiny gold finish. Most of our product pages allow you to order a free 3" sample of the frame for a better understanding of the finish and rabbet sizes. Please let us know if you need any additional help with your framing needs. Our friendly framing experts are available over the phone (1-800-332-8884) or on LIVE chat Monday through Friday. Thanks everyone. I went with the frosted gold and it is exactly what I was looking for. The front is smooth, like the smooth parts of gold leaf in a icon painting. The sides are textured with long lines unevenly spaced, giving it a whitish "frosted" look. Looks jost like the picture. It was exactly what I wanted. I hope this is helpful. It looks more like a polished brass with some texture. Definitely not spray-paint look. I was pleased with it. Simple but did the job and looks better than the picture online. I have a canvas that is 5"W x 7"H X 5/8" D and would like to use a a 2" mat with this frame. Is this possible? Do I need to get canvas clips or anything to hang it? BEST ANSWER: This is the frame that I use for most of my canvas paintings. Clips, connecting hinges and wire all come with this frame. The only way a mat will work with it, is for it to cover a 2" surround of the canvas. This is so small of a canvas, that most would be covered up. And if you don't want your mat to get dirty, it will need glass over it or an acrylic front. If the canvas is mounted on a wooden frame, it will have to be the size of the frame, I hope this information helps you. We typically do not recommend using a mat with a canvas but we do offer liners for our wooden frames that can give you a similar look. 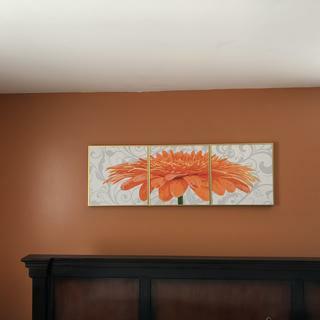 This frame would allow you to frame a canvas only and would come with the needed hardware for framing and hanging. For our wooden frames you can order canvas clips to go with your frame. Canvas clips work best; you'll need 2 per side. But, you can also get good results by using standard spring clips with scraps of foam board or cardboard for shims under them. As this is such a small mount, there should be no problem using spring clips with shims. I had a 24 x 36 inch canvas, no matter, and the frame accomodated it well with the corner clips included. I'm not sure how you would attach a mat to the canvas then to the frame. Is this frame type suitable for hanging an unmounted piece of fabric? BEST ANSWER: I've done something similar with this frame; layer glass, matte [if any], your fabric, foam board. Spring clips should hold everything tight against the front of the frame; because this frame is so deep, however, I normally bend the spring clips to give more tension, or shim between the foam board and frame using scraps of matte or foam board to give more tension. The extra width of this frame makes for an especially-attractive mount. We would recommend adding the acrylic front and foamcore backing finishing options to your frame order. This way the fabric can rest between the acrylic and foamcore. This would protect your art and keep it secure when inserting into the frame. If you have any additional questions do not hesitate to contact our friendly framing experts at 1-800-332-8884. I used this frame for a canvas mounted on a wooden stretcher frame. It worked well. I don't see how you would attach an unmounted piece of fabric. There is no backing with the frame. The frame is attractive and light weight. Hope this helps. No, this frame needs a solid backed artwork. Hello, I want to print a photo on canvas with 40 width and 50 height and frame it with gold color frame.What depth should be the canvas? Which frame is better metal or wood? Any suggestion would be nice and helpful. BEST ANSWER: So, wood vs metal is a matter of taste, and your decor; I much prefer metal for photos and more modern artwork. The NC series for canvas [or for anything, really] is quite attractive and sturdy. It will hold up to a 7/8" thick canvas, and anything less thick can be shimmed with clips or foam. Hello Shohreh. For this size canvas, a wood frame would be best. They can either have a depth of 3/4" or 1 1/2". Thank you! what is outlet shop purchase? BEST ANSWER: Thank you for reaching out to us! A purchase made from our outlet shop is a clearance item. The items listed under our clearance section are not eligible for returns or exchanges due to them being discontinued. This frame, however, is not a part of our clearance section. Please let us know if we can further assist. My canvas that i would like framed is pretty thin in depth. Does this frame cover work for different depths? BEST ANSWER: Hello! Thank you for your interest in our frames! It sounds like you are framing a canvas panel. The NCFGL frame has a rabbet/depth of 1" which may require additional backing be placed behind the thin Canvas. If the depth of your canvas is less than 1/2", you may want to consider our Economy Rainbow Collection. 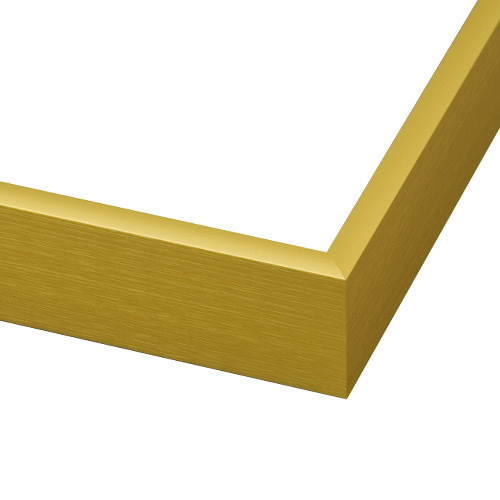 We have a gold metal frame with a depth of 3/8" that will work best with a thin canvas. Please give me more insight once you have measured the depth of the canvas. I will be glad to find a frame that will support the depth of your canvas. We look forward to assisting you. Happy Framing! Does this frame come with glass? BEST ANSWER: Our frames do not come with glass. We recommend using acrylic instead which is lighter in weight and shatter proof. We have acrylic in non-glare, u.v. protectant, and premium 3/32". The acrylic must be added on to the order and does not come with the frame. I need a 30 inch by 60 inch frame for a 1.5 canvas it doesn't have to touch the inside of the frame just the outside? BEST ANSWER: We have a collection of Canvas Floater Frames that we can custom cut to a size of 30"x60". These frames also have a depth of 1 5/8". The Canvas does not touch the inside of the frame in the Floater Frames. The Floater frames are designed to give an illusion that the canvas is 'floating' inside the frame. This is a very awesome and modern look. See the image below of our Gold Leaf Floater Frame from our 'Wood Canvas Floater Collection'. The frame has the depth that will accommodate your canvas, and there are other colors available.